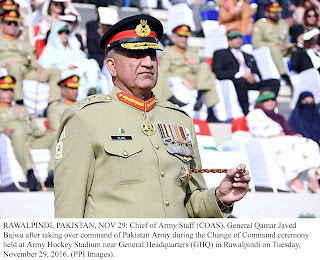 Truth by Kbaig: First Pakistani General to Demand “DO MORE” Against Terrorists! First Pakistani General to Demand “DO MORE” Against Terrorists! In November 2016, when General Qamar Bajwa took the command of Pakistan Army, Pakistan was entering into the second phase of the long war against terrorism. The first phase was that in which terrorists have established training camps, the army like operational headquarters, weapons manufacturing units, for suicide and terrorist attacks all over the Pakistan. All these terrorist establishments were in the areas adjacent to Afghanistan border. From Afghanistan, enemies of Pakistan were supplying these terrorists with latest automatic weapons, operational plans, instructions and heavy funds. Pakistan army cleared all the tribal areas from terrorists after countless sacrifices of lives. The operation was launched against the terrorists in the whole country. Many terrorists were killed in the operation in tribal areas while the rest of them either fled to Afghanistan under the safe heavens of power players in Afghanistan or garbed themselves like common citizens. The leadership of these terrorists had fled to Afghanistan before the start of the operation. They were continuing their terrorist activities from Afghanistan with the support of the Pakistan’s eternal enemy. After the destruction of the terrorist networks in Pakistani tribal areas, it was not acceptable for India to stop her terrorist activities and war against Pakistan through Afghanistan. India changed her tactics and started unprovoked firing over LoC (Line of Control Kashmir) targeting civilians in Azad Kashmir while on the other hand the drama of Urri Sector attack was staged as well. Hoping that on the one hand the credibility of Pakistani army would be hurt in the eyes of Pakistanis while Indians will be impressed as well that Indian army has the capability of surgical strikes like Americans. Indians wanted to engage international media and community on the LoC and tensions between India and Pakistan so that they cannot understand the negative role of Indians in Afghanistan and terrorism in Pakistan with the support of the NDS. This was the difficult situation when General Qamar Bajwa took charge as Chief of Army Staff (COAS). As soon as he took charge he had to face Indian unprovoked shelling over LoC, ensure law and order within the country, searching for terrorists and neutralizing, all are his duties. The most difficult task was to stop infiltration of terrorists from Afghanistan; the interference from Afghanistan, aggressive Afghan attacks, and propaganda all are the biggest test of his professional capabilities. Especially the propaganda that is going on within the country attempting to prove him weak. General Qamar Bajwa decided to establish strict Border Management System over the secret and open ways of entrance in Pakistan over the Afghan border so that unchecked movement across the border may be checked. When Pakistan started work on this project, Afghan National Army started cowardly attacking Pakistani army check posts over Turkham and rest of the border. In this way, Pakistan army was under Indian army’s attack on LoC while on the Afghan border, Afghan National Army was attacking Pakistan army at the beck and call of Hindu India. General Bajwa visited LoC many times, to encourage the troops on the forward posts and instructed them to give a befitting reply to Indian aggressiveness. A clear message was sent to India that any mischief or aggression would be dealt strictly. The aggression of enemy that has been going for last 15 years over Pakistani borders is not a big problem for Pakistan army because the sole purpose of Pakistan army’s preparedness has been to defend borders. The only difference is that before US invasion of Afghanistan under the garb of 9/11 Pakistan army has to pay attention to Eastern border only with India especially LoC. But after 9/11 India started exploiting Afghanistan as a second battlefield against Pakistan under the supervision of USA. In such circumstances, despite limited sources, Pakistan has to deploy troops all over the Afghan border as well. However, the biggest challenge for Pakistan are those terrorist elements playing in the hands of India who are mixed in the public and target innocent citizens, military installations, shrines, places of worship etc. The challenge for General Bajwa was to hit these invisible enemies hardly, identifying them within our own public and destroy their capability to execute any terrorist activity. Because these invisible enemies mixed within our own public were causing too many casualties to the general public. General Qamar Javed Bajwa visits Line of Control, on arrival, COAS was received by Commander Rawalpindi Corps Lt Gen Nadeem Raza and GOC Murree. One may remember that while crushing the terrorists and enemy agents and restoration of peace military has to face the worst resistance from political interests of famous political parties. Karachi is the biggest example where MQM’s leader Altaf Hussain enslaved whole Karachi for decades on the power of funds and weapons provided by India to MQM. Military institutions were aware of Altaf Hussein’s links with RAW but the political interests of political parties to be in power kept his anti-state activities under cover. The second biggest problem was the extortion, corruption in govt. departments and big projects, use of criminals by politicians against their rivals giving them huge funds, illegal occupation of state lands etc. changed the very basis of political parties. This was the best-suited environment for anti-Pakistan agencies that they openly operate in the country and no one can check or stop them. However, the breaking apart of MQM also became possible due to Pakistan army. Now there is the abundance of illegal weapons that are sometimes recovered from wells, secret underground compartments of homes or hidden in the walls. But no one has been arrested for hiding these weapons there. Drug Mafia is also at large. There is not a single govt. the department that is clean from corruption. Karachi which was among the developed cities in past now has organized gangs who help students cheat during exams. The irony of the fate is that all the big political parties have been busy in looting Karachi. But when the operation against terrorism started, those involved in bloodshed for last three decades got clean chit by just adding “Pakistan” with their political identity and borrowed time for reorganizing their criminal gangs. Traditional political parties consider the presence of such criminal elements inevitable for being successful in upcoming elections. They are unable to sense that without punishing the assassins and criminals their democratic power and govt. will be unstable and weak. General Qamar Javed Bajwa visited Ataturk Mausoleum and laid the wreath at the grave to pay homage to the father of the Turkish nation and penned down his respects on the visitor’s book. The hard time for General Bajwa was when on the “Dawn Leaks” army expressed concerns over the notification by govt. and rejected through a tweet by DG ISPR. This is a separate discussion that why “Dawn Leaks” was termed as a threat to Pakistan not only by Pak army but political govt. as well. Afterward, why did govt. step back from its stance gradually and stood behind those who were behind “Dawn Leaks”. Why did govt. dragged this problem for such long time and afterward issued such a notification that posed that govt. is trying to suppress the issue and has bargained with the army which was not acceptable for the army. When it was rejected by Army, a separate discussion was started in the country. On the one hand the perpetrators of “Freedom of Speech” criticized army as insubordination by a subordinate govt. department while public supported Army’s stance. These included those people who love Pakistan army along with those who were under pressure due to economic policies of govt. and inflation has made it hard for them to make both ends meet. After paying utility bills they have to take loans for food items, deprived of medicines and medical facilities, they are unable to buy the education for their children, their lives and property are not secure nor were they able to pay bribes for getting their legal problems resolved facing unemployment as well. After few days when the news of army taking back the tweet was reported people got disappointed. A typhoon was observed over the social media, everyone was analyzing army chief from his or her point of view. They were unable to understand that govt. has sacrificed one of its very important advisor, an old friend, and a bureaucrat by putting the liability of leaks on them. People were sad that why the army has taken back its tweet. Perhaps this was the most difficult decision for General Bajwa since his commission in 1980 and the journey being promoted to various ranks and commands in which he decided against the willingness of public in favor of the democracy and country’s integrity. The results of this decision will be felt in the long run. This should be sufficient that in the notification issued by govt. the loyal persons of govt. who were blamed for the leaks were standing with the Prime Minister (despite being removed from their responsibilities) when he appeared before the JIT (Joint Interrogation Team). Govt is still silent over the questions raised by the journalists. Moreover, taking back the tweet has stopped the way of Army’s interference or toppling the govt. by the army as it was done in the past. Although after 2008, the country is being ruled by democracy the taking back of the tweet has ended the impression that there are tensions between govt. and army. The chances for political govt. to become POLITICAL MARTYR has been annulled as well. On the other hand, Army has been serving public within its constitutional jurisdiction. The tragedy of oil tanker fire toppled near Ahmed Pur Sharqiya, troops from Bahawalpur Cantt reached on the spot on the orders of COAS; staff of CMH, nearby hospitals and health centers did their best but due to the shortage of manpower, facilities, resources, and machinery they were not able to achieve their goals. Any tragedy or natural disasters do not happen in selected areas they may happen anywhere. In the whole world, such departments are established who are always ready to tackle such accidents without waiting for the govt. orders or instructions. In Pakistan situation is that when residents of Parachinar staged sit-ins due to the loss of lives as a result of terrorist attacks, COAS has to come ahead for hearing the complaints of the affectees. He gave them all assurances through different religious scholars which was the duty of the political govt. He offered Eid Prayers with the troops deployed at the forward posts over LoC and spent the whole day there. 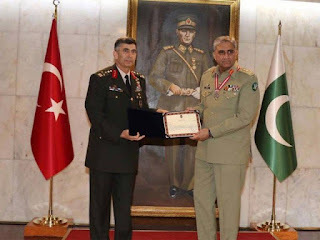 After taking over the command of the Pak army the situation was that keeping in view the importance of the role of General Bajwa in the war against terrorism within Pakistan, Turkey invited him for visit. When he reached Ankara on 20 June 2017, he was welcomed warmly. He visited the tomb of the founder of modern Turkey Mustafa Kamal Ataturk and laid the wreath there. After this, he went to the Army Headquarters where he was welcomed by the Army Chief of Turkish army General Saleh-Zaki. 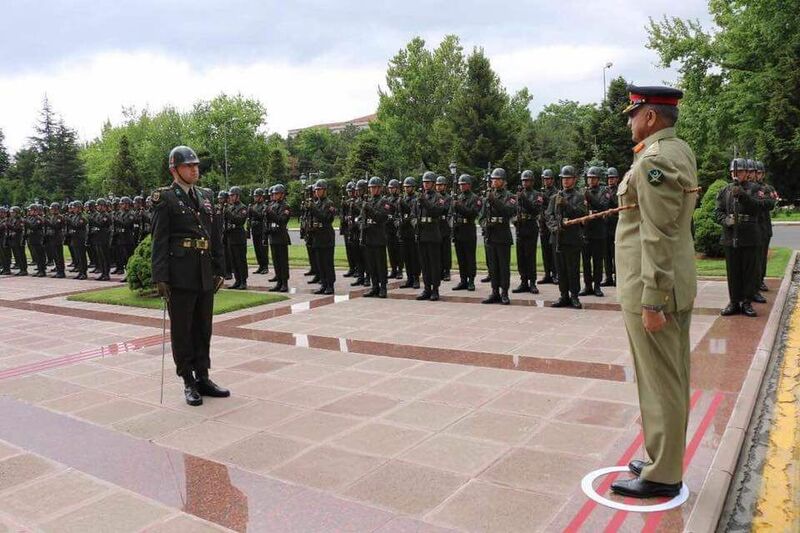 On this occasion, General Bajwa was presented with Guard of Honour. Afterward, General Bajwa was awarded the “Legion of Merit” as an acknowledgment of his military services. 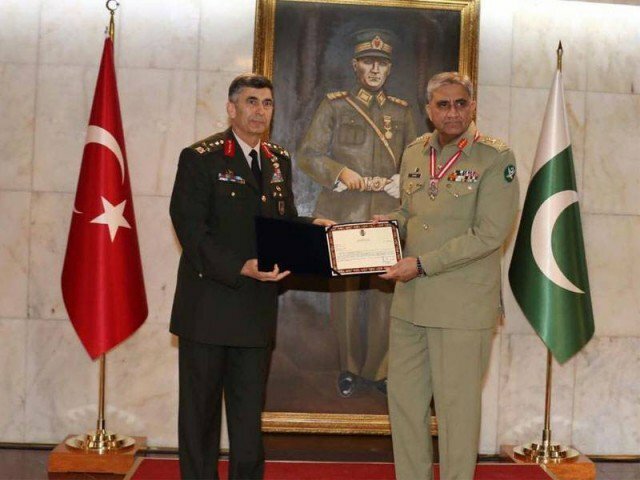 General Bajwa dedicated this to the martyrs of Turkish and Pak army. 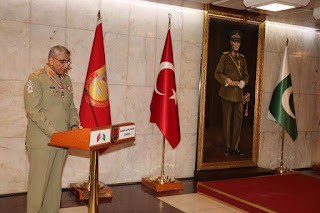 On this announcement, the officers and soldiers present in the ceremony clapped and chanted slogans in favor of Pak-Turk friendship proving that Pak-Turk friendship is historically old. 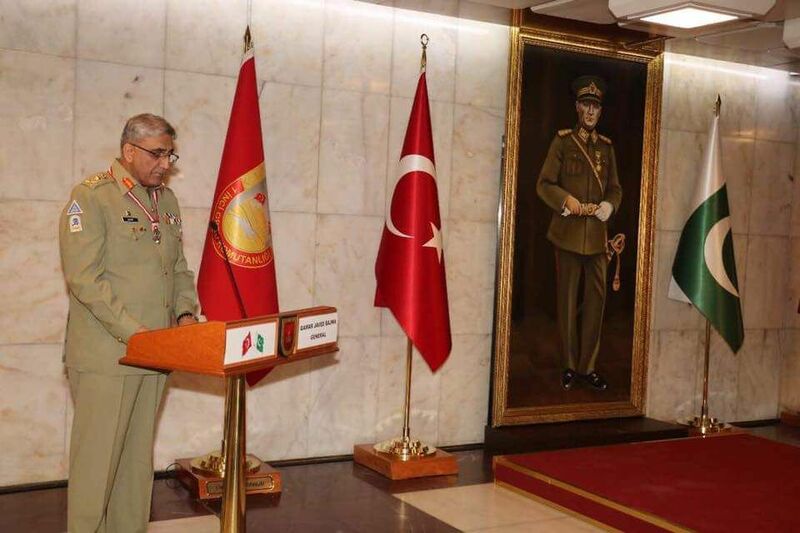 On Kashmir dispute, Turkey has always supported Pakistan while General Bajwa announced to support Turkish claims over Cyprus (here mentioning this that why our Foreign Ministry or rulers visiting Turkey often have not supported Turkish claims). In the light of changing international scenario, Trump’s coming into power, Army Chief’s visit to Turkey is very important as Turkey has decided to choose sides with China and Russia after being disappointed by the European Union. After the failed military coup, the distances between USA and Turkey has increased. While India in spite of working for the peace in the region is joining the USA as a sub-state to fulfill her aggressive nefarious designs against Pakistan and serve as a proxy warrior against China. The nexus between USA and India has increased the chances of upcoming terror attacks from Afghanistan manifolds, Parachinar and Quetta terror attacks before Eid may be quoted as an example. 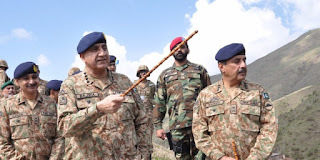 Although Pakistan army is on red alert on the Afghan border but due to the RAW’s links within Pakistan which have been disclosed by Indian State terrorist Kulbhushan Yadav, the support to the leadership of TTP leadership in Afghanistan by Indian and Afghan secret agencies, keeping in view the whole scenario General Bajwa has demanded from Americans to DO MORE against terrorists saying that before this America has been demanding from Pakistan to ‘do more’ against Pakistan, Pakistan has destroyed all the terrorist hideouts in Pakistani areas so this is time for American and allies to destroy terror camps in the areas under their control. This stance of COAS has been given coverage by US newspapers which show his determination and achievements against terrorism.